One of my favorite things about volunteering at food & wine events are the people I get to meet. As a volunteer in The Local Palate Celebrity Chef Kitchen at the inaugural Savannah Food & Wine Festival this weekend, I helped greet guests, set up and break down the stage in between talents, collected trash and even got to be a sous chef for Food Network Star finalist, Linkie Marais. 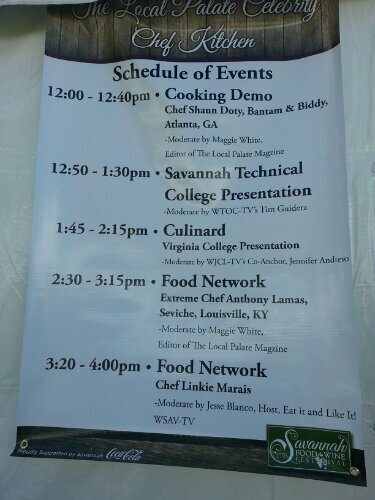 I got to interact with festival guests from neighboring coastal towns like Hilton Head S.C., culinary students at Savannah Technical College and Virginia College, and walked away from the event with a 4-pound leg of lamb, a package of mushrooms and one big red onion because I was in the right place at the right time. Backstage with Food Network Star Finalist Linkie Marais (left) prepping ingredients for her cooking demonstration. Linkie Marais cooks mushrooms and onions in the Big Green Egg for her Lamb Ragu dish. Linkie was a finalist on Season Eight of Next Food Network Star. It was awesome to meet someone I had watched on TV last season. She was extremely personable and very friendly. I helped Linkie and her manager clean and chop mushrooms for her cooking demonstration. Plus, they gave me $40 worth of lamb that would have otherwise been discarded. Thanks for the meat and vegetables that you had an overabundance of Linkie…I will make great use of them. What an awesome, unexpected volunteer perk! Martha Nesbit (right) and I worked together in the Celebrity Chef tent. One of Martha’s cookbooks: Savannah Celebrations. Mrs. Martha Nesbit is a long-time food writer in Southeast Georgia. I got to work with her in the Celebrity Chef tent, and later purchased an autographed copy of her cookbook, Savannah Celebrations. I have no doubt that it will become a favorite resource, and I can’t wait to dive in to her recipes! 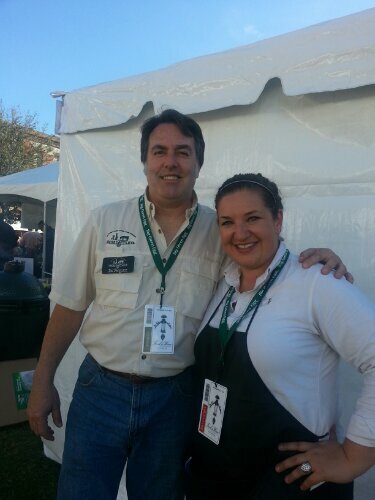 I first met Culinary Producer Libbie Summers at the Inaugural Saint Simons Food & Spirits Festival in 2012. This year, she was signing her Whole Hog Cookbook in the Celebrity Author’s Tent. We couldn’t see my phone screen and didn’t know if we were getting a good picture or not, but looks like we did pretty good Libbie! Ha. It was great to see you again! We’re officially old pals. I also ran into local Brooklet farmer, Del Ferguson of Hunter Cattle Company at the event. It’s always good to see a familiar face when you’re out and about. Way to represent Statesboro in The Hostess City Del! A random plate of food during the event. Other presentations included Executive Chef Shaun Doty from Atlanta’s Bantam & Biddy, Savannah Technical College, Virgina College and Food Network’s Anthony Lamas from Extreme Chef. My favorite presentation of the day was Chef Jean Yves Vendeville from Savannah Technical College’s Culinary Arts program. He and his team operated like a well-oiled machine and in his 40-minute cooking demonstration, cranked out three different dishes for the audience to try. He was funny, engaging, educational and entertaining. When his presentation was complete, I told him I wanted to be his student one day. 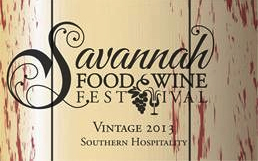 For Savannah’s first ever food & wine festival, the turn out was impressive. Nearly every event during Nov. 11 – 17 was sold out. The Southern, culinary shin dig was definitely a team effort and took the hard work of many. I am confident that it will only get better with time. I was honored to be a part of the experience and fortunate to have made such great connections while volunteering! Thanks to everyone who made it happen. *Special thanks to my awesome boyfriend Kurt, who brought me my blog business cards that I forgot at home during the event.